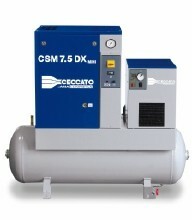 The CSM Mini 3-10HP range needs no more than 1m² to provide compressed air on your workspace. The CSM Mini Floor-mounted compressor can be used as an extension of your existing air system or can be put close to the place of use. The CSM Mini Tank-mounted (200L) is a perfect stand-alone system. This is also an important advantage of the all-in-one CSM Mini Dryer version, which is also perfect for places where compressed air needs a low dew point. The CSM Mini is a perfect small power range, compact, low maintenance, economical and extremely reliable.